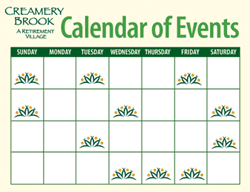 Independent living apartments and cottages at Creamery Brook Village are available on a rental basis with no significant upfront investment. Simply move-in to the apartment or cottage of your choice with a one-year lease. Our residents and families have the peace of mind knowing there is priority access to the complete on-site continuum of services and care at Pierce Memorial Baptist Nursing and Rehab Center.